Every parent wants to do what is good for their child; this goes without saying, but sometimes it can be a challenge to know what to do, and when to do it. 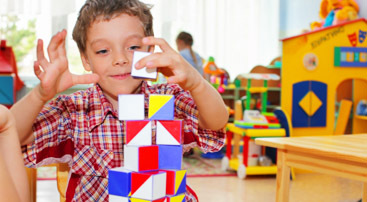 Providing a child with the appropriate activities at the right developmental stage can seem like a full-time job. We are Learning Wonderland Preschool and we are lucky to have it be our full-time job to find the appropriate activities are appropriate for a child’s developmental stage. Luckily, there are a few activities that are always appropriate for children. One of these activities is playing outdoors. 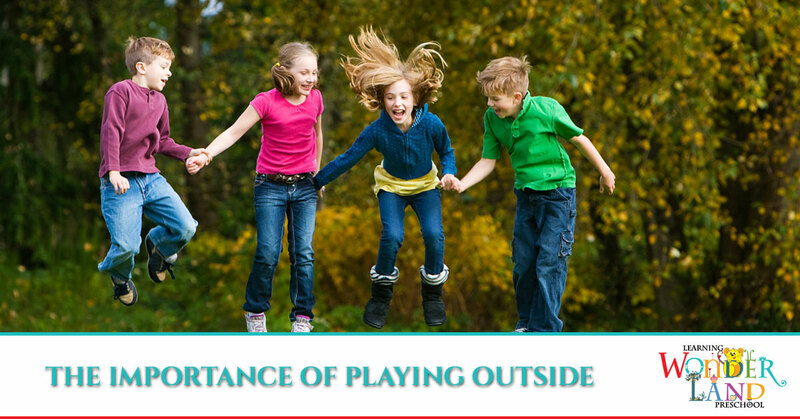 In this week’s blog, we’ll cover the ways playing outdoors can benefit your child and you! 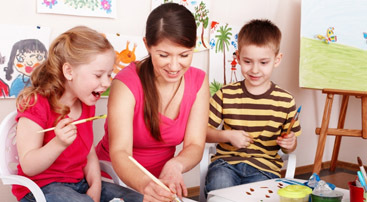 The basis of this curriculum correlates with renowned educational psychologist Jean Piaget’s theories that children construct their understanding of the world through experience. One helpful thought that stems from this theory is that humans benefit from having hooks from which to hang their learning. These hooks are primary, personal experiences. For example, if your child has recently spent the day at the beach, when they overhear an older sibling reading “The Island of the Blue Dolphin,” they will be able to put information gained from the book into a schema constructed from the day at the beach. This information could include the sounds of seagulls, the feel of the beach, or the smell of the salt air. Outdoor play allows children to expand their understanding of the world beyond what they can learn from a movie or from a book. Outdoor play also promotes imagination in children. Be it a playground, the beach, or your backyard, a common scene can take on epic proportions when the playground becomes the planet Mars or your backyard becomes the Old West. Children only need a little time and space to imagine scenarios that can take them to new worlds! Outdoor playtime is also an opportunity for children to stretch their creative muscles. From making up songs for jumping rope to building a fort out of sticks and a coat, children, given the chance, can demonstrate amazing creativity. According to the Child Mind Institute, the average child spends just seven minutes playing outdoors while they spends over seven hours in front of a screen. You don’t need to be a child development expert to known that this is a recipe for disaster. Children who are passively entertained for hours can end up expecting to just sit back and be entertained, instead of being actors in their own lives. Healthwise, this is also detrimental. The levels of childhood obesity have reached record proportions in America, with 17 percent of children being rated as obese. Over 31 percent of American children between the ages of 10 and 17 are overweight. You can help your child avoid these pitfalls by modeling good behavior and getting outside and being active from their earliest years. Another benefit of getting kids outdoors and moving is that when it’s time to sit down to learn, they won’t be so hyper that they can’t sit still. 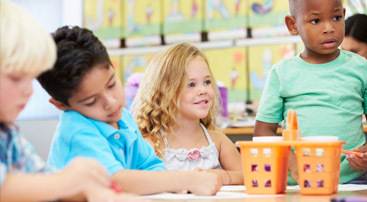 Young children are full of energy, and giving them appropriate opportunities to run it off so they can focus when they sit down is beneficial for their education, and their teacher will thank you. It is, of course, important to make sure children are safe when they are outside expanding their minds and burning off energy. The dangers that need to be taken into consideration and prepared deserve a word of caution here. Because Florida is a humid subtropical climate, insects thrive. Most are harmless, but mosquitoes need to be avoided. With the influx of new diseases carried by mosquitoes, such as Zika virus, it is important to take precautions. Using mosquito repellent and avoiding being outdoors at dusk and dawn are two ways to reduce your child’s exposure to them. Sun exposure is an inherent danger in Florida as well. Making sure your child has sunscreen and a hat on before going outside are important ways to avoid sunburns and to teach proper care of their skin. Florida wildlife can also pose a danger to your child. Make sure they do not play near bodies of water because of alligators, and knows to avoid snakes, spiders, and fire ants. If you are in a more remote area, teach them to about the dangers of playing in the woods posed by of large or venomous snakes, bears, wild boar, and panthers. Call us today to learn how we include safe outdoor play in our day care schedule.